I was added to the google+ world recently (within the last year), and although I’m still not entirely sure how to use it, I did manage to become a follower of +Zagatand I find that some of the articles etc… provided by this site are really interesting. Like the fact that it was toasted marshmallow day recently. I did not toast a single marshmallow on toasted marshmallow day but I did start researching/writing this blog post on that day so I feel as though I toasted many marshmallows in notion. The marshmallow was originally created from the root of the “Althaea Officinalis” plant also known as the marshmallow plant and was used as a medicinal confection by the early Egyptians. When mixed with honey it was found to help cure sore throats and coughing. The french used the root extracts mixed with Rose water and egg meringue; calling it Pate de guimauve; this version more closely resembled the modern day marshmallow. Eventually the root extracts of the marshmallow plant were eliminated and the marshmallow became more of a candy or treat. Although I love the idea of candy for health! Modern marshmallow recipes all call for similar ingredients. Sugar, corn syrup, water, gelatin, dextrose, and vanilla. Recipes containing gelatin are not vegetarian friendly, however there are ovo-vegetarian friendly, and vegan friendly recipes for marshmallows available online. So no one will miss out on the goodness that is the marshmallow! Boil the sugar water and karo syrup together until strings form when you pull out the spoon. Beat the egg whites until stiff peaks form, and then slowly add the sugar mixture beating on high until stiff and glossy. Frost cooled cupcakes immediately, and store at room temp in a sealed container if cupcakes are not cool enough to frost right away, refrigerating this frosting can cause it to become overly sticky and difficult to use. This is a great recipe to top off a fantastic chocolate cupcake. 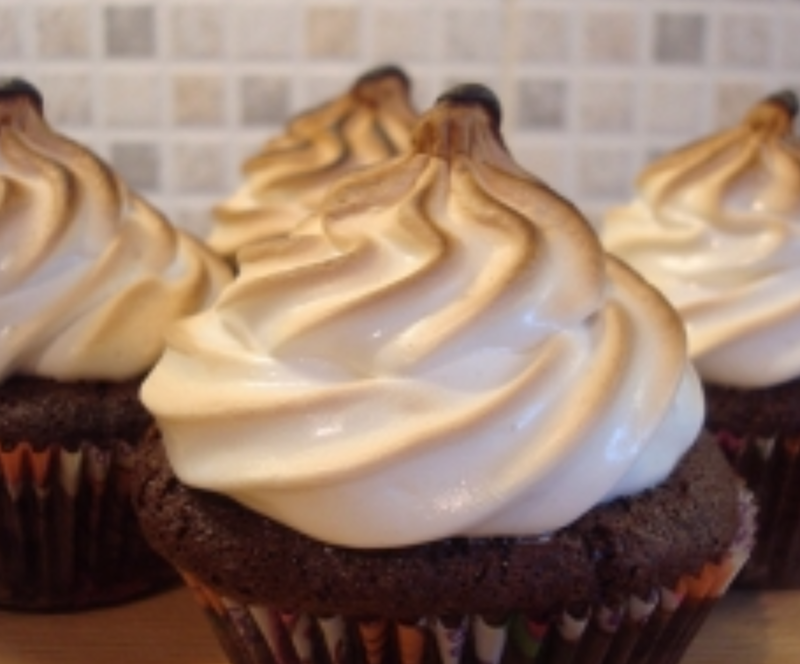 For an added treat, use a small kitchen torch to toast your marshmallow frosting once piped onto your cupcakes! Yum!! These look great, wish I had known about toasted marshmallow day!